Don’t spend too much time searching in books, when you have these cheatsheets at your disposal. 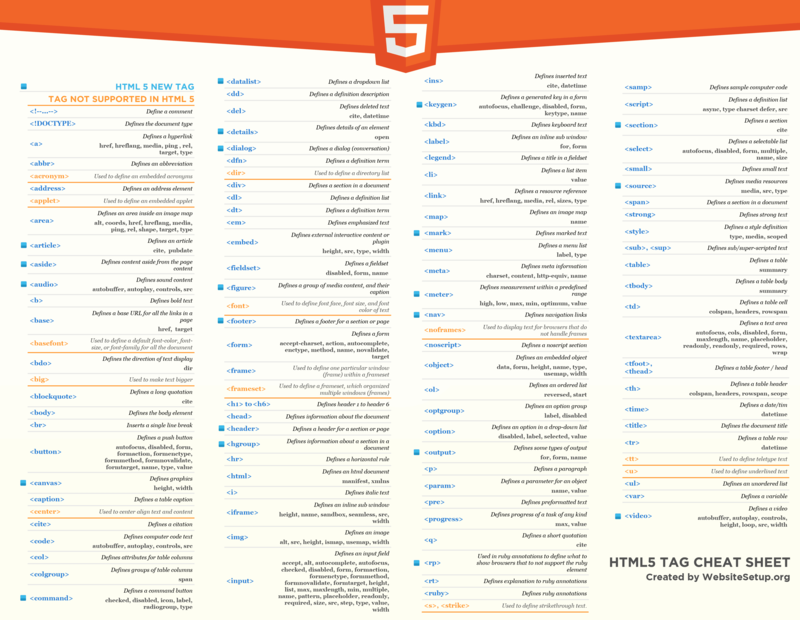 HTML5 is the fifth and most recent version of HTML. This markup language finds its use in presenting the content on the web and helps in its proper structuring. HTML5 is also being widely used in the cross-platform applications that could be easily run on any device. cssCSS3, the latest CSS standard, is totally compatible with the earlier CSS versions. This web styling language described the look of a web document when it’s written in HTML. This widely popular and general-purpose programming language is easier to learn. Python promotes code readability and lets coders express themselves in fewer lines of code. Its large standard library is often called Python’s biggest strengths. This widely popular and open source scripting language cab be embedded in HTML and finds wide use in the web development process. PHP is a simple language for a newcomer but it’s good to have a prior knowledge of HTML and CSS. Designed by Yukihiro Matsumoto, this object-oriented and dynamic scripting language is used to develop apps and websites. Just like Python, Ruby is an easy-to-learn programming language for the beginners. Ruby also powers the Ruby in Rails framework, which is used on GitHub. SQL (Structured Query Language) is a special-purpose programming language that’s widely used for managing data stored in relational databases. SQL was initially developed at IBM and initially called SEQUEL. Also there is a popular open source Relational database MySQL and here is the cheat sheet for MySQL. Fontawesome is the most popular icon font out there, that gives you scalable vector icons that can instantly be customized — size, color, drop shadow, and anything that can be done with the power of CSS. Bootstrap is a popular, responsive css framework for quick designing of web sites. If you design and develop web, you know the importance of hex color code.